Mary Lattimore de Philadelphia es una arpista de formación clásica que ha editado tres álbumes y varios discos en colaboración con otros músicos. Ha grabado y ha tocado con varios artistas como Kurt Vile, Sharon Van Etten, Steve Gunn, Jarvis Cocker, Meg Baird y Thurston Moore. “Collected Pieces” es un disco de seis temas y es el segundo lanzamiento en Ghostly International que se editó en formato cassette y en digital, el que previamente estuvo disponible para descarga y streaming en sus páginas de Bandcamp y SoundCloud. Mary toca el arpa de 47 cuerdas Lyon & Healy cuyos sonidos sutilmente procesa electrónicamente y agrega algunos efectos en este disco que fue grabado entre 2011 y 2016 y mezclado por Jeff Zeigler en su vieja casa en Philadelphia. Este cassette evoca los 12 años vividos en esta casa que tuvo sus luces y sombras y que se aprecian en la música con sus bellas y tristes melodías. El coro grabado con la celestial voz de Mary estremece por su belleza y el armónico sonido del arpa hace de “We Just Found Out She Died” una canción sublime. En “It Was Late And We Watched The Motel Burn” varias notas del arpa están distorsionadas, reflejando el momento inquietante del incendio. “The Warm Shoulder” representa seguramente el cariño recibido cuando niña pues la música tiene un carácter de canción de cuna. Mary despliega con su arpa canciones encantadoras y de una sutil elegancia. 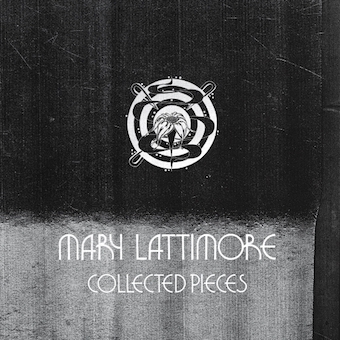 Philadelphia artist Mary Lattimore is a classically trained harpist who had recorded and performed with renown artists like Kurt Vile, Sharon Van Etten, Steve Gunn, Jarvis Cocker, Meg Baird, and Thurston Moore. She has released three albums and records alongwith other musicians. “Collected Pieces” is a six piece record and her second Ghostly International which was released on cassette and digital format, previously available for download and streaming on her Bandcamp and SoundCloud pages. Mary plays the Lyon & Healy 47-string harp whose sounds subtly electronically processes and adds some effects to this record that was recorded between 2011 and 2016 and mixed by Jeff Zeigler in his old house in Philadelphia. This cassette evokes the 12 years lived in this house that had its lights and shadows and are appreciated in music with their beautiful and sad melodies. The chorus recorded with Mary's heavenly voice unfolds beauty and the harp harmonious sound makes "We Just Found Out She Died" a sublime song. On "It Was Late and We Watched The Motel Burn" the harp strings are distorted reflecting the disturbing moment of the fire. "The Warm Shoulder" surely represents the affection received as a child as the music has a lullaby song character. Mary displays with her harp charming songs and with a subtle elegance.